When reporting on video games, it’s not often that we have to discuss terrible real world tragedies, such as the burning of the Notre Dame cathedral on April 15th in Paris, France. After burning for hours, the popular tourist monument remains standing, to the surprise of some, though, its spire and most of its roof have burned down completely. This 800-year-old piece of architecture is a result of impeccable design, and will be restored, according to French President Emmanuel Macron. 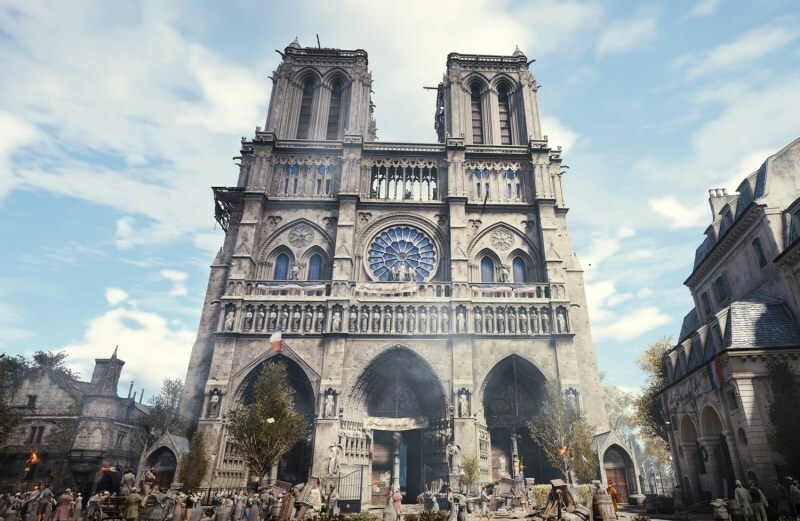 According to a report from PCGamesN, the 2014 video game, Assassin’s Creed Unity, which is set in France, might be of some help to French architects in their efforts to restore the building. Apparently, a level designer, Caroline Miousse, spent over two years meticulously constructing the digital version of the cathedral for the game. Miousse studied the Notre Dame extensively and noted that she “felt like I was going home” when she finally visited the the cathedral in person. She worked with blueprints of the building that showed exactly how it was constructed, as well as various books, and even Google. Despite this rendition of the Paris cathedral not being 100% accurate, it can still be useful for reference, as 3D mapping is integral to the restoration process. You may notice that the spires are not present in-game since they were built after the timeframe in which the game is set. The team at Ubisoft had to take a few liberties to make scaling the building fun from a gameplay perspective, but the fact remains that this rendition can still be used as reference during restoration. Even if Assassin’s Creed Unity isn’t the best game in the series, we can all probably agree that it’s a proud moment for the video game community—when a video game can help solve real world problems. We wish the best for everyone affected.